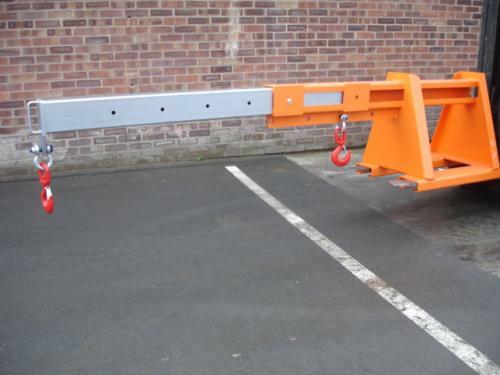 The Fork Mounted Extending Jib IEJ from Invicta Attachments are very similar to the normal Fork Mounted Jib, the extending version allows for the movement of long and awkward loads from inaccessible and hard to reach areas. With up to 9 different lifting positions and with the added benefit of two hooks and shackles so as to cradle your load. 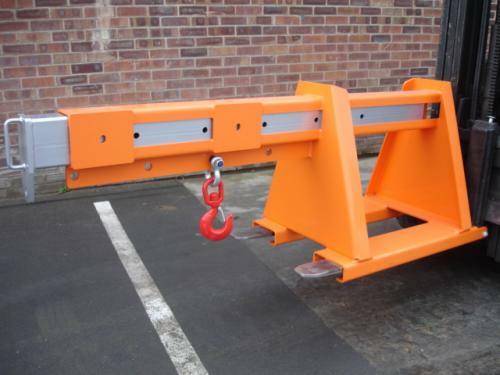 Multi-hook positioning is available from 1000mm up to 3000mm load centres. All the fork mounted jib's come supplied with two swivel hooks and two shackles to suit the desired capacity if the jib. Maximum fork section 150x50mm at 435mm Centres. Zinc plated heel pins for safe attachment to the forklift truck. painted bright orange for safety.